If we had the ability to improve maintenance feed consumption likely would improve profitiability of beef production. To make genetic improvement we need genetic variability. Is there variability for maintenance energy? Hotovy et al 1991 measured intake and fasting heat production on twins to estimate heritability of maintenance energy. The heritability was 0.51. But, putting a large number of cattle through metabolism chambers is not feasible. What tools are available to change maintenance energy? 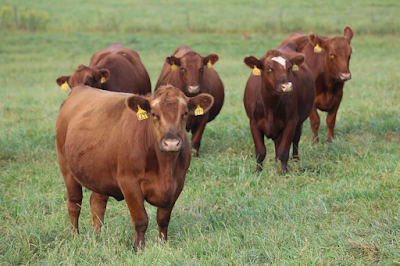 For two beef breeds, we see an unfavorable trend for mature size. If we go from a 1000 pound cow to a 1500 pound cow, we have increased the maintenance requirement by 35.5%. But, maintenance energy is a function of both body weight and milk production. $EN index produced by the Angus Association is an economic index weighting both body weight and milk production. Maintenance energy EPD (Mcal/Month), which accounts for mature weight and milk, is an EPD that allows selection of cows requiring less feed for maintenance. Both $EN and ME EPD have both had unfavorable genetic trends (although ME EPD has plateaued the last few years). Let's assume an average mature weight of 1,350 pounds. If a cow has a body condition score of 5, there is no adjustment. If a cow has a body condition score of 7, the adjusted mature weight is 1144 pounds. Red Angus Association: mature weight and body condition scores represent roughly 20% of the numbers of weaning weight records reported. For American Angus Association, there are over 9.1 million weaning weight records. There are about 120,000 mature weight records. 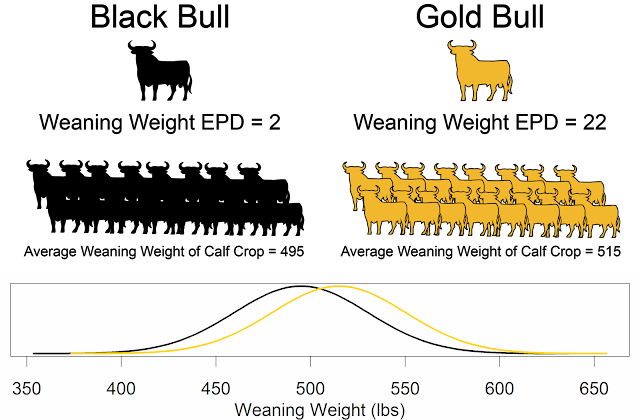 The genetic relationship between birth weight and yearling weight is 0.55. Despite this strong relationship, we have successful created curve bender bulls with good calving ease and high growth. The relationship between mature weight and yearling weight is 0.72. Just as we have broken the genetic antagonism between birth weight and yearling weight, we need to do the same thing for yearling weight and mature weight. There has been encouraging progress on the research side. We have improvements in genomic predictions for feed intake. The correlation between feed intake on forage and grain is favorable (Shike), but we need to look at this from a genetic correlation perspective. "There is evidence that selection can be successful for reducing maintenance energy requirements while still improving growth." Enns said. Using an economic index, a cattle herd in Australia held mature size constant but increased slaughter weights. Selection indexes work! Think what we can do with EPDs if we have the necessary data. We need more data for mature weight and body condition scores. See bifconference.com for more information about this talk.